In today’s AEC industry, risk mitigation is a key factor in ensuring a cost effective project. One way to reduce this risk is to prevent costly mistakes in the field by detecting them within your Revit Model Project. The Interference Detection Tools within Revit will allow you to find all the clashes within your model and help you fix your design before it is constructed in the field. If you would like to learn how to utilize this tool to your fullest potential, then this course, Revit Essentials: Interference Checking is for you! In this course, you will learn all about Interference Checking. 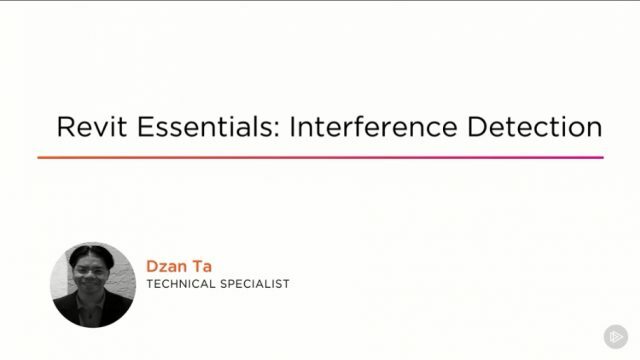 First, you will learn what interference checking is. Next, you will learn where and when they are used and how to create your own custom interference check. Finally, you will learn how to resolve any conflict found utilizing the interference checking tool. When you complete this course, you will be able to apply what you have learned to ensure your designs do not have any conflicts within the Revit model.